—Campaign finance expert Donald Tobin, a witness at a House Ways and Means Committee hearing Wednesday. At issue was how the IRS will investigate whether so-called “social welfare” groups are violating their tax-exempt 501(c)(4) status by making political activity their primary purpose. A recent Treasury Department audit criticized the IRS for its poor response to complaints about the groups, but the IRS has said it will consider rule changes to crack down on abuses—just don’t expect anything new in time for the 2012 election. 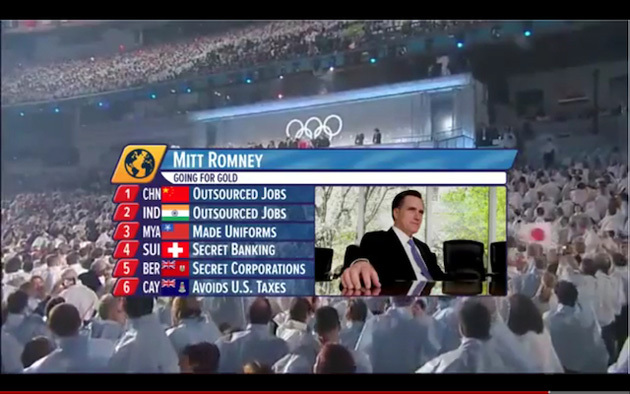 On Wednesday, the pro-Obama super-PAC Priorities USA Action unleashed an Olympics-themed ad attacking Mitt Romney for outsourcing jobs and stowing away money in offshore tax havens. But the ad contained a copyrighted image of Romney during his time as chief executive of the 2002 Winter Olympics in Salt Lake City, and quickly drew a protest from the International Olympics Committee. YouTube pulled the ad, and Priorities USA Action will not be able to air it on TV. Meanwhile, pro-Romney super-PAC Restore Our Future plans to spend $7.2 million on ads during the 2012 Olympics; the Obama campaign (which is formally unaffiliated with Priorities USA Action) plans to spend up to $6.5 million. • Super-PACs Can’t Give $1 Million to a Congressman. But This One Did: The Republican Governors Association exploits a loophole to drop a giant campaign gift on Indiana Rep. Mike Pence. • Romney’s Rainmakers Dump Millions Into His Super-PAC: Together, all super-PACs raised $55 million in June—a record month. • Meet the Front Group Leading the Fight Against Taxing the Rich: Does the National Federation of Independent Businesses really represent small business owners—or billionaires?